The region known as “Southern Maryland” – or “SOMD” as the locals abbreviate it - is composed of the state's southernmost counties on the "Western Shore" of the Chesapeake Bay. The region includes all of Calvert, Charles and St. Mary’s Counties and a thousand miles of shoreline along the Chesapeake Bay and the Patuxent River. 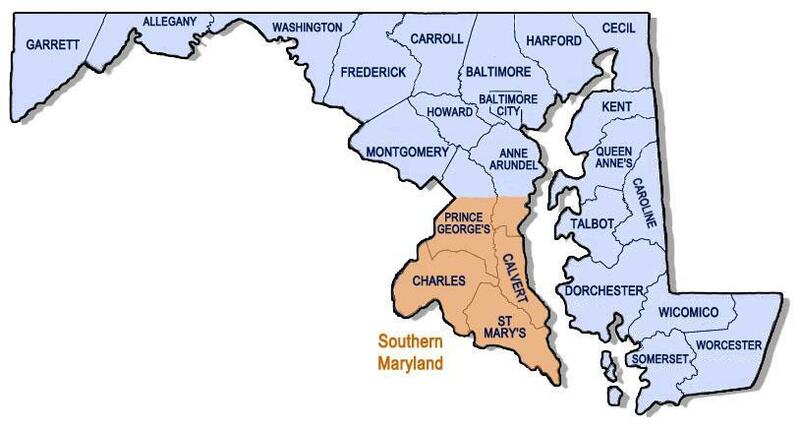 Sometimes the southern portion of Anne Arundel and Prince George's Counties are included in people's definition of Southern Maryland. Although the area was traditionally a rural and agricultural region, in recent years, suburban development has expanded from the Washington DC metropolitan area and the Southern Maryland communities have experienced tremendous growth. The area’s strong population and economic growth is due, in part, to the close proximity to the Nation’s Capitol. Families are finding the area to be an affordable alternative to the high cost of housing in Northern Virginia and the more developed communities of Maryland. The region has a unique network of scenic byways joining its small towns and an abundance of state and national parks, historic sites and properties, unique shops and waterfront restaurants. Hiking, biking, boating, fishing and crabbing are popular recreational activities. Discover uncommon adventure and unspoiled beauty just a short drive from our nation’s capital. Take a trip to where time really does move a little more slowly. Hunt for 15 million-year-old fossils, climb the steps of historic lighthouses, visit museums, experience festivals and eat savory seafood. There’s always something to enjoy in Calvert County. Beautiful water trails, secluded parks, historic sites, scenic byways, unique shops and waterfront restaurants await your visit. Enjoy hiking, biking and bird watching on our 13-mile rail trail or take in a game or special event at our award winning minor league baseball stadium. Maryland begins here! For over 350 years, Maryland’s first colony has been welcoming adventurers! Discover a 17th-century “city,” climb to the top of a Potomac River lighthouse, get lost in a Tidewater sunset. Shop and dine in historic Leonardtown or take a crab feast cruise on the Chesapeake Bay.